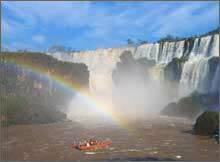 Argentina is one of the most vibrant and captivating countries in South America. The country stretches from the tepid waves in the Tropic of Capricorn in the north to the icy waters of Cape Horn. Between these extremes, the Andes tower above the Gran Chaco and the Pampas (home of the gaucho) before giving way to rugged Patagonia in the south. The incredible natural beauty of Argentina lures hikers, skiers, mountain climbers, and other adventurers from all over the world while cosmopolitan Buenos Aires, one of the world's great capitals, attracts people looking for a twenty-four hour metropolis. Buenos Aires is often called the "Paris of South America" because of the European style architecture, cafes, boulevards, cultural venues, fine restaurants, and clubs. The people of Buenos Aires, called porteños, are known for their exotic style and flair. They are as proud and as passionate as the tango, the popular dance they invented and continue to perform today. 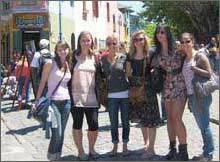 ELI's Argentina programs are based in Buenos Aires, the elegant and energy-filled capital. Buenos Aires shares many of the problems other Latin American capitals are experiencing: poverty, pollution, lack of infrastructure, and unemployment. Volunteers can work with local organizations devoted to fighting poverty, as well as with at-risk children, in soup kitchens, or on health education campaigns. Interns in Buenos Aires have the opportunity to test their career interests, gain work experience, and realize long and short term goals in a variety of internship programs. Along these lines, ELI partners with organizations in Buenos Aires devoted to providing at-risk youth with opportunities for educational and social advancement. Volunteers assist with a wide range of activities, including after school tutoring, teaching English, providing childcare for kids of working mothers, leading recreational activities, and just giving the children the attention they need to thrive. *Volunteers for this program do not have to speak Spanish but must realize that they will be in an entirely Spanish-speaking environment. Participants must commit to at least a four-week program. The medical program in Argentina is designed for pre-medical and medical students looking to gain experience in the health care field and learn about the issues facing the Argentine medical system. Placements in this program are available in both a large public hospital and a community health center. At the hospital, participants will join a group of Argentine medical residents to observe examinations and assist with other tasks in the hospital. Interns with the health care center, which focuses on bringing treatment and disease prevention to impoverished communities, will assist in administrative tasks as well as help local doctors with community involvement workshops, prevention campaigns, and patient care. "I generally worked from about 8/8:30am to 12/12:30 Mon-Fri. The first two weeks I was with Dr. Di Meglio. She was an obstetrician. I helped to check-over patients by measuring women’s bellies, finding the baby’s heart rate, checking for edema and determining what side of the stomach the baby was on and what position it was in. She was the most “hands-on” doctor and had me do the most and explained the most about different diseases that affected women and their babies during pregnancy. The next two weeks I was with Dr. Romero, a pediatrician for babies up to about 1 month. She had me measure babies’ heads and body length and weigh them. Dr. Romero had quite a few more patients and moved them in and out quite a bit more quickly than Dr. Di Meglio and so didn’t really explain a lot-though she did point out things like the importance of the soft spot on a baby’s head and the signs of a premature baby. The next 2 weeks I was in surgery. I saw quite a few surgeries such as a man getting a tumor removed from his throat, a woman getting her uterus removed because it had a tumor and a man get a tumor taken off the top of head. Obviously I didn’t do anything during surgeries besides watch! The next 2 weeks I was in la guardia (the ER, sort-of, it’s really more of a clinic). I observed different doctors checked over adults with colds, pneumonia, the flu, broken bones, etc. I mainly observed in la guardia. The next week I was with Dr. Sanchez, a neonatologist who examines babies born in the last 3 days. She also teaches mothers how to breastfeed and how to dress their babies. Dr. Sanchez explained about different diseases that often affect babies and also about the vaccinations required in Argentina. I helped weigh some babies and mainly observed." *Interns in this program must have a high to intermediate level of Spanish knowledge. You’ll make an immediate difference working with this organization that offers food and clothing to the city’s homeless and needy. The group also provides a place for the displaced to participate in educational and recreational activities and their children to play or do homework. Volunteers spend time with those who seek help, cook and serve food in the soup kitchen, help in kitchen cleanup, assist with participants’ homework or play with children who rely on the group’s services. *Volunteers for this program do not have to speak Spanish but must be comfortable in an entirely Spanish-speaking environment. Participants must commit to at least a four-week program. Interns and volunteers are always needed to teach English and other subjects to adults and children throughout Buenos Aires. Those interns that would like to gain experience in the classroom can shadow and assist an English teacher in a private school. In the teaching program, interns will gain experience in lesson planning and classroom management while teaching several grade levels in a day. "I did background research to see what political and social problems were occurring in certain provinces, I tabulated and synthesized data from students after they had participated in financial education programs, and I researched racism in Africa for a background Model UN paper. Also everyone spoke Spanish in the office, and they were patient with me when I could not articulate what I wanted to say. Most of the research I did was in Spanish, and I definitely feel my Spanish improved due to this internship. 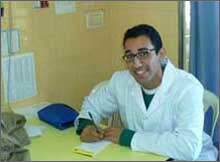 This internship was great and I recommend it to anyone who wants exposure to NGO work in another country." *Interns in this program must have a high to intermediate level of Spanish knowledge, and commit to at least eight weeks. *Interns in the journalism program must have an advanced level of Spanish knowledge, a background in journalism, at least two previously printed articles, and must commit to at least twelve weeks. We can be more flexible with communications placements. "When asked about something directly, the attorneys would be very willing to answer questions and help out. When we went to the courts, a usually busy attorney sat with us and explained the mechanics of the legal system. It was awesome, but you have to really be persistent to get certain experiences. This is very much an internship for a self starter who speaks fluent or at least advanced Spanish." *Interns in this program must have an advanced level of Spanish knowledge and commit to at least eight weeks with the program. This center works to support women and their children who are victims of family violence. The objective of this shelter is to provide protection, accommodation, food, and overall attention to women who have suffered violence at home and who have nowhere else to go. Our volunteers can take part in various tasks, such as teaching English, helping with the cooking, assisting women in the shelter, etc. You will also be able to work alongside professionals (social workers, P.E. teachers, counselors, etc.) that assist women that are victims of physical and psychological abuse. This Home is the result of some joint work between a group of volunteers of the local diocese and the City Government of Bariloche. Homeless people from the city are offered help and attention here. The Home works all year round and assists approximately 40 people during the night and a smaller number in the morning and the afternoon. This service offers accommodation, food, some space for body cleaning and changing clothes. In addition to giving support, people are offered medical assistance and creative workshops in various fields: ceramics, music, writing, etc. There is also practical training for trade professions. Our volunteers will join the team of local volunteers and will help with different tasks, such as preparing food, organizing various recreational and eductional workshops. All participants must have an intermediate level of Spanish, be willing to commit to at least 2 weeks, and be in great physical and mental shape. 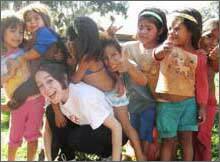 Our volunteer programs in Bariloche run year round. The majority of these projects are appropriate for volunteers aged 18 to 75+. During the high season (January, February, July, August and mid December) we recommend volunteers sign up to the program as far in advance as they can. The minimum time commitment is 2 weeks. What’s included: daily Breakfast buffet, shared accommodation in a mixed dorm (5/6 pax), private bathdroom inside the bedroom, airport picks up, orientation upon arrival, program supervision, in-country 24/7 volunteer support and in-country administration costs. What’s not included: Air tickets, local travels and personal expenses, international insurance against sickness, accident and 3rd party liability. October, November and mid December and only includes breakfast. Lunch and dinner would be your responsibility. 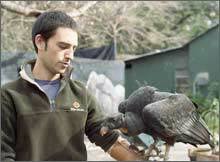 ELI Abroad offers a unique program with an educationally focused organic farm located within the majestic Nahuel Huapi National Park, about 25 km away from San Carlos de Bariloche, Argentina. This program serves families, young people and adults who wish to learn and participate in the activities of an organic farm. Volunteers will have the option to collaborate on educational projects, learn about food production, marmalade and cheese making, organic harvesting, etc. all within a breath-taking natural reserve. Volunteers in this hands-on program will learn about sustainable and local efforts to preserve and protect the untouched natural wonder that makes Patagonia such a special place. By getting involved directly with initiatives related to organic farming, gardening and environmental conservation, volunteers will not only gain valuable skills, but also help this wonderful project advance and meet its sustainability objectives. Vegetable garden tasks: preparing the terraces, weeding, sowing and fertilizing the land, transplanting seedlings. Production tasks: harvesting, producing marmalades, liquors, dairy foods, preserved foods. Maintenance and building tasks: building, maintenance and repairing shelters, corrals, stables, paths, canals, fences and irrigation systems. All these jobs are done mannually using shovels, wheelbarrows, shears, hand tools so it is impoartant to be in good physical shape. You will be working approximately 5 hours per day, from Monday - Friday. Saturdays and Sundays will be free to explore the surrounding area. The farm is well located for hikes within the National Park without needing to venture far. The Laguna Llum, Playa Muñoz, Refugio Frey, Lagos Gutierrez and Mascardi are all nearby and very accesible. By hopping on public transportation you can also choose to spend the weekend in Bariloche City, El Bolsón, Cerro Tronador, etc. Options are endless! . The participants in this program will share a cabin exclusively for volunteers. This place has a fully equipped kitchen, private bathroom, a fireplace and a comfortable sitting room where you can appreciate the beautiful surrounding area. This farm offers volunteers 3 daily meals prepared with fresh and organic ingredients. For breakfast you may have mate, tea or coffee with baked goods and homemade bread; and lunch and dinner are generally made with the local produce itself, using raw material from the farm as much as possible. This includes chicken, eggs, vegetables, etc. Some homemade meals may also include gnocci, grilled chicken in a big pan (pollo al disco), breaded meat (milanesas) with mashed potatoes or rice, Curanto (traditional indigenous way of meat cooking), pizza, fresh pasta, rice or lentils stew, asado (Argentinian traditional way of grilling meat), vegetable tarts, polenta with sauce, locro (Traditional spicy bean-and-corn-based stew), empanadas, soups, etc. This program is availble from September to April requires that volunteers stay at least 7 days to get the most out of this experience. Have at least a begineer level in Spanish or French, as they are the only languages spoken in the farm. - Have a health insurance that covers against accidents, illness and civil liability. - Be flexible and have a good predisposition towards living in a natural environment, without an Internet connection and city facilities. - Be in great physical and mental shape. Bring a sleeping bag, thick clothes, comfortable clothes for work (clothes may get dirty, stained or broken), working shoes/waterproof boots, a thick jacket, winter gloves, working gloves, towels, swimming suit, sunscreen and a flashlight. If possible, it is recommended to bring a book for the farm library. It can be fiction or non-fiction and in any language. It is important to become well informed before the trip about: Geography, distances, climate, transport lines, the environment, food, and currency exchange. There is a limited Internet connection at the Farm, so this program is not advised for people who wish to be connected to the Internet daily. Internet connection through a sim card is possible, but the signal may not be stable depending on where in the farm you are located. Application Fee: $200USD This is in addition to the program fee. 3 meals a day, shared accommodation at a cabin exclusively for volunteers, airport pick-up, program supervision, in-country 24/7 support. Flights, local travel,personal expenses, excursions and weekend travel, international insurance, return trip to the airport, etc. *Please contact us for the cost of the programs in Patagonia and the Horse Rescue program in Cordoba. It is sometimes possible to combine multiple projects, however, please note that there will be an additional fee for each extra project that you add to your program. * A damage deposit is required for all host families and shared apartments. It must be paid at check-in and will be refunded at check-out if there is no damage. Money will be taken out of the deposit to pay for any damages done by the participant. The deposit is generally between $350-400USD. During your program in Buenos Aires, you will be accommodated in a local homestay. ELI truly believes that this is the best way to fully immerse in another culture and get the most from an international experience. You will have a single room and share common areas with your house mates. Our homestays are of different sizes, some only rent one room while others rent several rooms. If you are looking for something specific in a homestay please let us know so we can try an d accomodate your request. Half-board (breakfast+dinner) is not usually provided but can be added upon request. We carefully select the accommodations and make sure that they are located in nice and safe neighborhoods with good infrastructure and public means of transportation. Typically, you can find supermarkets, restaurants, bars and shopping centers nearby. Internet access is available at 100% of our accommodations! * A damage deposit is required for all host families and shared apartments. It must be paid at check-in and will be refunded at check-out if there is no damage. Money will be taken out of the deposit to pay for any damages done by the participant. Participants will be accommodated in a multi-story, dormitory-style accomodation which is perfectly located in the neighborhood of San Cristobal, in the heart of central Buenos Aires and within a short walk from the many attractions of this vibrant city. The volunteer House has free WiFi and great facilities for volunteers, including a roof-top terrace and barbecue area, communal kitchen and living areas. Participants can expect to share a bedroom with up to three other volunteers of the same gender. Bedrooms are comprised of single beds and bunk beds with bedding and towels provided. Bathroom facilities are shared between volunteers with hot showers and western-style toilets. Participants will be provided with groceries to make a continental style breakfast every day, which is prepared in the kitchen/dining room of the volunteer house and includes toast and spreads, cereal and fruit. Volunteers can prepare/cook lunches and evening meals for themselves in the well-established communal kitchen of the which has a gas hob, oven, microwave, fridge, and pantry space. The start dates for the Argentina programs are flexible, but please note that orientations are conducted on Monday. Participants are welcome to arrive on a weekend, but orientation will not start until the following Monday. We ask that participants book flights arriving during the day between 5:00 AM and 11:00 PM. Please do not arrive between December 18 and January 3 in order to allow our coordinator and staff to spend the Christmas and New Years Holidays with their families. 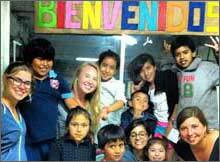 ELI works with a private Spanish language school that provides intensive, small group classes at a variety of levels. The private classes are taught on a weekly basis and include 15 hours of instruction each week. Classes begin every week. It has all the elegance of the old world in its buildings and streets… All the newsstands and book shops - what a literate place, one thinks; what wealth, what good looks! Buenos Aires is like New York, Paris or any great city - you’d need a lifetime to truly explore it all. It has everything an urban lover holds dear: sophisticated, attractive residents (called portenos); diverse, walkable areas; museums, theaters and galleries; world-class shopping; endless cafes, clubs and restaurants for all tastes and budgets. It’s a huge city, yet you can easily get around it on the metro and public transportation, although taxicabs are also both plentiful and inexpensive by American and European standards. The city’s bike sharing program also gives you the fun option of touring the city on two wheels, on your own or with an organized group. A little research and you’ll be ready for this magnificent destination. Guidebooks will direct you to must-see sites (we recommend Lonely Planet and Rough Guides); popular websites and blogs can point out attractions and off-the-beaten-track destinations. Are you more comfortable with digital info? Download helpful travel apps! Nervous about your Spanish? Of course, there’s an app for that! 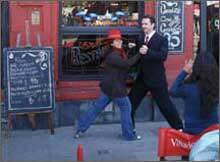 Don’t let the size of Buenos Aires (often referred to as BA) intimidate you. At ELI, we believe the best way to tackle BA is neighborhood by neighborhood. From the posh Recoleta and trendy Palermo Soho, to the bohemian San Telmo and modern, happening Puerto Madero, each area will give you a deeper insight into the city and all its richness. Parillas, empanadas, pizza and much more: Buenos Aires is a food lover’s paradise, even if you don’t eat meat. Just remember that Buenos Aires residents (called portenos) are major night owls. They tend to eat very late by North American standards: on weekdays often after 9 p.m. and on weekends, many don’t start eating until after 11 p.m.
Football: Whether you call it football or soccer, joining the passionate, expressive Argentine fans at a game in BA will be an exhilarating experience. Tango: Go to a milonga. These popular dance gatherings are one of the unique symbols of Buenos Aires. There are places for all skill levels: milongas for beginners and for those familiar with the dance and its etiquette. Discover Argentina’s famous wines. You don’t have to travel to the country’s wine region, Mendoza! Ask local waiters to recommend a malbec or a torrontes -- Argentina’s signature wines -- or enjoy a wider variety at a BA wine tour. Visit Eva Peron’s grave at the famous, historic Recoleta Cemetery. There’s never been anyone else like the legendary “Evita,” Argentina’s controversial, tragic and endlessly fascinating former First Lady. For an introduction, see the musical, or stream the more accurate Argentine biopic, then visit the Eva Peron Museum or take an Eva Peron guided tour. Follow in the footsteps of Jorge Luis Borges: Argentina’s iconic, world-famous poet who has left an indelible mark on the city and its culture. And that’s just scratching the surface of Buenos Aires, a city that offers endless entertainment, surprises and pleasures. And with ELI, it’s all at your fingertips. The site for many ELI Abroad placements, the city of Mar del Plata is also a great destination on its own. With dazzling 10 miles of beach, it’s Argentina’s top oceanside resort, and a favorite weekend getaway from Buenos Aires. When you’ve had your fill of the beach, check out Mar del Plata’s famous port and ship graveyard, or explore the lush ravines, cliffs and dunes outside the city. Because it’s a major hub as well as a popular tourist destination, Mar del Plata offers all the restaurants, sightseeing and nightlife any Argentine visitor might wish for. It bears repeating: Argentina is enormous. Always keep distances between its top destinations in mind when planning a trip. Argentina’s train service is lacking, outdated and not recommended. For many ELI-ers renting cars isn’t practical. One option to consider is local airlines to fly between the more far-flung destinations. While not the cheapest (note that foreigners pay considerably more than Argentines on the local airlines), flying will save you a lot of time. For example, a flight from Buenos Aires to Iguazu Falls takes less than two hours, while a bus ride to the Falls is more like 18-20 hours. That said, the inter-city bus service in Argentina is quite good, and ELI recommends it as an excellent choice for budget-minded travelers. You’d have to have an almost unlimited timetable to see everything Argentina has to offer. For most ELI-ers, that’s not possible. Many decide to limit their travels to the areas around their placement - be it Buenos Aires or elsewhere - and perhaps one or two longer trips. Luckily, there’s plenty to chose from! Here are some of the most famous areas to consider exploring. One of the largest waterfalls on the planet, Iguazu is listed on many travelers’ must-see lists. It’s among the most spectacular sights in a country known for many of them. Nearly 2 miles long and set in a jungle that’s home to diverse wildlife, Iguazu offers a world of adventure, everything from trekking, biking and photo safaris to rafting and boat rides. The most visited spot in northwest Argentina, this lively and artsy colonial town is a great base for exploring the stunning nearby Andes, red-rock valleys, vineyards and colonial villages. It’s a trip that will please city and history lovers, as well as those who want to hit the hiking trail or visit more out-of-the-way attractions. The pampas may be among the most enduring symbols of Argentina. These extensive grasslands are home to gauchos (Argentina’s iconic cowboys) and historic agricultural estancias that produce world-class cattle, wool, produce, grain, cotton and dairy. San Antonio de Areco and La Plata are popular destinations for a day trip from Buenos Aires; if you feel like splurging, consider the luxe La Bamba de Areco, a lovely estancia hotel where you can embrace your inner gaucho on a horseback exploration into the surrounding pampas. Other, less pricey options include Estancia La Cinacina and Estancia Los Dos Hermanos. Argentina’s second-largest city of Córdoba is a historical marvel: founded by the Jesuits in 1573, it’s home to 16th and 17th century churches and fine colonial buildings, including the famous settlements of Jesuit Block and Estancias of Córdoba (Manzana Jesuitica y Estancias de Córdoba,) a UNESCO World Heritage site. At the same time, Cordoba is very much alive with a hip, artsy 21st century vibe thanks in part to its young population, students at the Universidad Nacional de Córdoba, the second-biggest in Argentina. Nightlife, restaurants, along with the city’s food and artisanal treasures will keep you busy and entertained long after you finish soaking in the historical stuff. Mendoza, whose name is synonymous with one of the world’s great wine-producing regions, will appeal to anyone who likes to combine city pleasures with outdoor adventures. Here, you can spend your day visiting Argentina’s famous vineyards, on your own - or with an organized tour; in the evening hit the bustling city’s many restaurants, cafes and clubs; and the next day go trekking, horseback riding or rafting right outside the city. Visitors routinely say, Mendoza offers so much, you should give the area at least a few days to really explore. Although primarily known as a world-class ski resort (and as Argentina’s chocolate capital!) Bariloche also offers many summertime pleasures. Officially known as San Carlos de Bariloche, this beautiful city is located at the foot of the Andes, and within the gorgeous Nahuel Huapi National Park. It’s an excellent starting point for exploring Argentina’s Lake District, a natural wonder on both sides of the Argentine and Chilean border. Bariloche has a fun European vibe with lots of restaurants, bars and a variety of hotels for all preferences and budgets. The wealth of nearby hiking, fishing, biking and adventure tours make it one of Argentina’s top summer destinations, although it’s easy to escape the crowds as soon as you leave the town center. Doesn’t all this sound exciting? Don’t you just want to hop on a plane and start exploring? With ELI Abroad it’s almost that easy. Call us. Let’s talk about your Argentina adventure. Most internship fields available. Work in the beautiful coastal city of Valencia!